This 1 litre natural spray deodorant refill bottle is an economical and environmentally friendly alternative. It contains up to 10 refills for your 100ml spray bottle and can even be used to top up your travel spray too! Easy to use, light bottle: just remove the lid and pump nozzle from your empty Salt of the Earth spray bottle and pour in the refill. It is recommended that you refill in the sink because this product contains salt and may mark some household surfaces. The refill offers the same long-lasting and effective protection against body odour, in an economical format, perfect for the entire family. Keep out of reach of children when not in use. 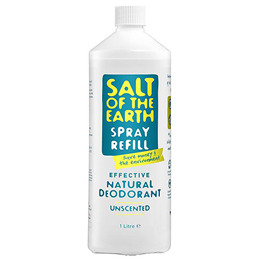 Below are reviews of Salt of the Earth Spray Deodorant Refill - 1 Litre by bodykind customers. If you have tried this product we'd love to hear what you think so please leave a review. This stuff is brilliant. No propellantime refill. It doesn't smell, you don't smell, you don't sweat. No need for anything else on the shelves! 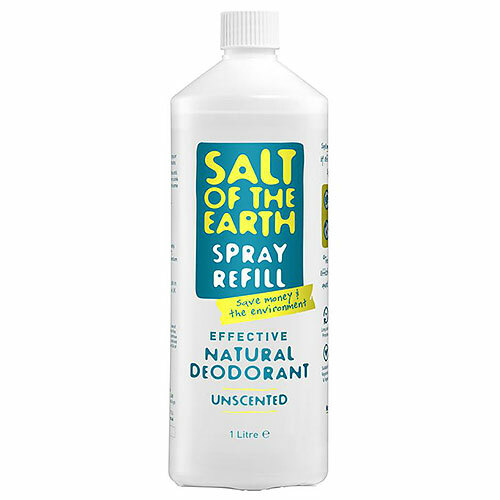 Salt of the Earth Deodorants are the best I have ever used. They don't leave any white marks and coverage for the whole day with no nasty smells. The refill bottle I purchased is excellent value for money too! All this and excellent service and delivery from bodykind. Highly recommend both company and product. Arrived quickly. Quality product. Bought small spray deodorant previously but wanted to refill to save packaging and waste. This refill is great. Good customer service from bodykind. Thank you. We've been using this for several years now and it is, in our opinion, as effective as any standard deodorant. My teen son uses this because it is unperfumed; it's a great product for anyone with either hypersensitivity to smells or allergies to synthetic additives. Because it's a spray, you can use it similarly to body spray, not just on underarms. I've met other families of young people on the autistic spectrum who've found this product, because of its lack of smell, to go down really well (we tested loads of perfumed ones but this was the only one my son could cope with - what a relief to find a deodorant he feels comfortable to use!). I love the fact that its packaging is gender-neutral.